Enhance your Microsoft Access applications with amazing visual effects, interactive features, integration with the operating system, and other enhancements that are sure to amaze your users, co-workers, clients and boss! Add powerful functionality to your Access application in minutes with the only collection of ActiveX custom controls designed specifically for Microsoft Access. Best of all, the controls support all Access versions from Access 2000 to 2016 (32 and 64-bit versions), so your database can look great even if your users don't have the latest version. Give your Access applications a professional polish to differentiate your work! Total Access Components includes 30 controls to enhance your user interface and simplify development. 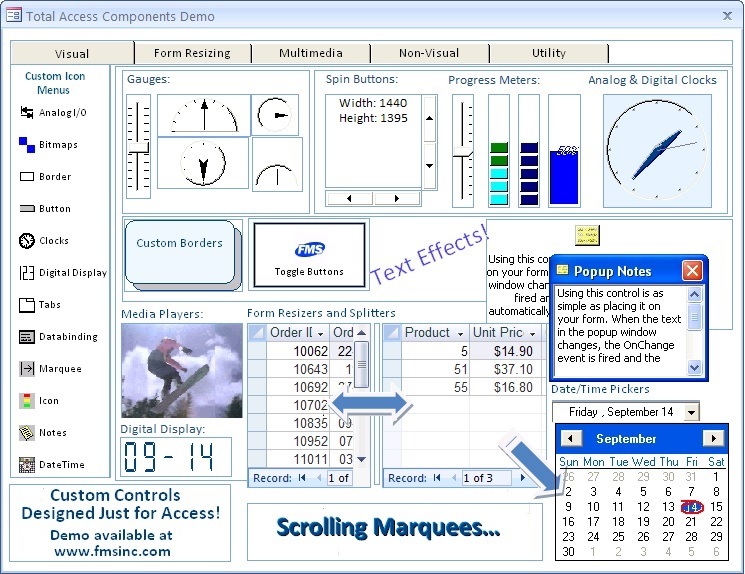 Designed specifically for Access, Total Access Components understands Access forms and reports, and many visual controls can be data bound directly to your fields to reflect their values graphically. Design forms that automatically adjust to the user's workspace. 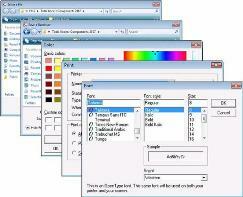 Resize a form proportionally so all objects are enlarged and centered items remain centered. Optionally enlarge/shrink font point sizes, or keep the font fixed to show more text. Easily add features that would otherwise require extensive Windows API calls or VBA programming. Total Access Components encapsulates complex Windows API calls to simplify your ability to add standard Windows dialogs to your MS Access applications with little or no code. Simply invoke our control, set a few properties, and get the results you need. This also eliminates the need to create your own forms to replicate these features, and guarantees that your user interface matches your users' operating system for a more integrated solution. See the controls in action with our interactive demo database. You won't believe what you're seeing is in Access! Many features require no programming! Just place a control on your form or report and set some properties. If you're a VBA programmer, you can modify most properties in code and invoke methods for additional functionality. Total Access Components includes an extensive tutorial database with source code containing working examples of every control. On-line help and a professionally printed 158 page manual are included. The latest version supports Microsoft Access 2000, 2002, 2003, 2007, and the 32 and 64 bit versions of Access 2010, 2013 and 2016. An older version is available for Access 95 and 97. Since ActiveX controls are either 32 or 64-bit dependent, the controls from the 32-bit version can be added to your MS Access forms and reports for use by Access 2000, 2002, 2003, 2007, and the 32-bit versions of Access 2010, 2013 and 2016. The 64-bit version of Access 2010, 2013 and 2016 requires 64-bit ActiveX controls and cannot use the 32-bit version. When the 64-bit version of Total Access Components is installed on a machine, it can insert those 64-bit controls. It can also automatically use databases containing the 32-bit controls without any manual changes.